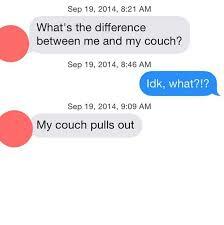 Ah Tinder Fails, we hope none of these were you?! Seems like the whole world is on tinder. We hear stories of wins and tragic Tinder fails. In case you’ve been living in outer space Tinder is an app which allows us you to ‘swipe’ potential partners to the right if their photo appeals or left into the dating dustbin if not. If the one you like has ‘liked’ you there’ll be ‘ping’ for a match and you can begin chatting….or sending outrageous sexual propositions! If you swing and connect on Tinder you might eventually find yourself needing our services. At the Big Boys Club, we’re famous for putting on the best bucks parties in Melbourne. Send us your funny tinder screenshots and we’ll discount your bucks or boys night out. Tinder Fails – too funny!